Although the war in Europe ended on the 7th May 1945, it wasn’t until the 15th August that the vicious fighting in the Pacific finally came to a close. The decision to drop two atomic bombs onto the cities of Hiroshima and Nagasaki brought Japan to its knees. Upon their surrender, peace was declared, although not formally agreed until the 2nd September. ‘Victory over Japan’ or VJ Day marked the end of six gruelling years of war (from 1939-1945), with countless human loss on all sides. In Britain on the 15th August 1945 cheering crowds flooded the streets to celebrate. Bonfires were lit as singing and dancing went on into the night. This year marks the 70th anniversary of VJ Day and the British Government is getting ready to commemorate the moment when peace came to the Pacific. It’s a time to remember those who lost their lives in the conflict. Over 97,000 British and Commonwealth military personnel and a further 120,000 Japanese died during the war. The stakes for peace were high. Veterans, former prisoners of war and civilian internees will be attending a morning service alongside Her Majesty the Queen and the Duke of Edinburgh at St Martin-in-the Fields Church in Trafalgar Square at 11am. Representatives of the Commonwealth Nations and those Regiments that formed the 18th Infantry Division of 1942 will be amongst the congregation. This event is being organised by the National Far East Prisoners of War (FEPOW). At 2pm veterans and their families will join HRH the Prince of Wales and the Duchess of Cornwall at a commemorative event on Horse Guards Parade. Hosted by the Royal British Legion and Her Majesty’s Government, senior political and military officials will stand alongside serving members of the Armed Forces. Tri-service bands will add to the atmosphere as wreaths are laid and a ‘Drumhead Service’ is conducted. A flypast of four of the most loved and iconic planes will take place, flanked by a current RAF Typhoon. Look out for a Spitfire, a Dakota, a Hurricane from the Battle of Britain Memorial Flight and a Royal Navy Swordfish. The Gwalia Male Voice Choir and the London Welsh Male Voice Choir will be singing, as well as Charles Dance, a well-known actor reading the poem ‘The Road to Mandalay’ by Rudyard Kipling. Led by military bands, veterans, civilian internees, their families and serving military personnel will make their way through the streets of London to Westminster Abbey. The procession will end with a reception, hosted by The Royal British Legion. There will be large screens erected around Whitehall so we can all be part of the Horse Guards ceremony. Cheer them on as they parade through the streets and show your support for the brave men and women who helped secure peace 70 years ago. 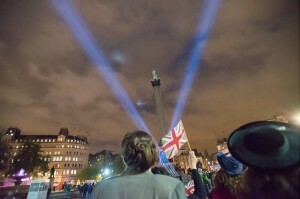 VJ commemorations aren’t just limited to London. Events will be taking place across the country. To learn more about how you can mark the big day near your home town, check out the Government website for details.